With its ingenious design, My Paint Saint makes touching up paint—and storing it—quick and hassle-free. During his college days, inventor Mark Lacy supervised maintenance for a hotel. Paint touch-ups were full of problems and inefficiencies. He designed My Paint Saint to eliminate every single one. The airtight can has a high-quality brush built into the lid and a generous white space to jot down the color that’s inside. To open, twist off the ring (no screwdriver needed) and get right to work. The ring screws to the bottom of the can so you won’t lose it. Wipe off any excess paint on the two plastic ledges inside. Didn’t wipe off enough? There’s a drip catcher on the rim around the brush. To reseal the can, put the brush back inside (no need to clean it), and twist the ring on (no mallet needed). With the airtight seal in place, both paint and brush will be ready (and not dried out) for next time. Hello everyone! I'm proud to introduce My Paint Saint to The Grommet. I'd be happy to answer any questions you have! I am extremely honored and grateful to have My Paint Saint launch on The Grommet! We're glad to have you on here, Mark! I and all the bHome bloggers LOVE My Paint Saint ! It is an ingenious product we all wish we had thought of first, but are very happy to have. My Paint Saint makes one of life's nasty chores a breeze. As a result of touch up painting being so painless with MPS, you do it more often and your home looks more beautiful. After all we bHome bloggers are very busy, but having a beautiful home is our business. My Paint Saint lets us get the job done in minutes! My Paint Saint saves time, effort & money. That is good! @Kelly Thank you so much Kelly! How much paint does the container hold and how long can it sit? Michael, My Paint Saint holds 13oz. of Paint. Slightly less than half a quart. The bristles are synthetic PET. They will outlast the life of the paint. First I'm thinking that you would never put a large amount in the can, but while painting it can hold a normal amount. just for storage you need to keep the level low? @Michael Thank you so much for the kind words. Yes, it is designed and priced to have one for each color. In our short history we have sold about 5000 Paint Saints and the average quantity purchased per sale so far is 3.2. I apologize I am a little confused about your storage question, can you clarify when you have a chance? What a fabulous idea. How easy is it if you want to change the paint in the jar do a different paint? @Jeni Thank you so much! While I designed this to have one for each color, it is easy to clean. Since the brush is always stored in a moist atmosphere you will find that cleaning the MPS brush is much easier than a brush that has been exposed to air. The container is ABS plastic with a high gloss finish so the paint will wash right off. I love this idea! Due to my husband's job we are frequently moving. When we move into a new house we are usually inheriting the old owner's array of paint cans for touch ups. When it comes time to sell the house there is nothing more frustrating than trying to find a match of paint amongst the old paint cans only to find the paint is all dried up and trying to get the hardware store to get a close match. This product will allow me to have paint ready for touchups for staging the house for the sale plus the bonus of not having to remember to not pack my paintbrushes. @Jaime Thank you so much! After reading about your frequent moves, I definitely think this product will be a great fit for you. @Lynn Im confused. Are you one of our Kickstarter backers? If so, I am not sure if you got our update this week but we are in the process of shipping to all backers right now. Please email me at [email protected] or call me at 281-667-1124 if you need more information on your Kickstarter order. Thank you so much for your support! Mark, does it work with oil based paints also? @Desmond My Paint Saint is intended for use with water based paints only. As a first time business owner and small time maker I did not want any potential liabilities with flammable liquids. I believe what Michael was asking is what amount/level of paint do you recommend keeping in the container for storage. Enough to cover the bristles? or just any amount? @Lori You can leave any amount. I have tested this extensively. @Michele Thank you so much Michelle! Firstly, you will find that the paint stored in a My Paint Saint can will not separate fast like your used to. It amazes me that paint is still sold in metal cans. The factories that make these metal cans have the ability to uniformly press on the lids with machinery. When consumers like myself open these cans and hammer them back on we never get a good seal. Something I learned through years of designing this is that Oxygen not only causes paint to dry out, it also drastically speeds up the rate at which paint separates. The seal in a paint container is absolutely critical. My Paint Saint uses the modern way us humans seal liquid in a container and keep air out. A silicone gasket. If you look under almost any water bottle, soda bottle, Starbucks mug, baby bottle etc. you will see a silicone gasket. Unlike metal cans you can open and close MPS over and over and get a fantastic seal. This drastically slows down the separation process. If you do happen to find some separation in the paint in a Paint Saint, The brush has extremely long fine bristles. Simply swirl the paint in the container with these bristles and wipe the excess off with the shelves inside the container and repeat. Thanks again of your order! What happens after the paint has sat for several months and needs shook? Seems like that would make a mess on the brush . . .
@JUDY Thanks for your interest. Please see my answer to Michelle and let if know if this helps? @Robert The instructions on the back of My Paint Saint are very detailed about this. You will only want to fill to the max fill line of 13 o.z. if you are about to do a significant amount of painting before placing the brush back in the container. The answer to your question is yes. The instructions on the back specifically explain to keep the paint level below the 13oz when placing the brush back inside the container. Please realize this is a very sizeable product. The overall length is just under 12 inches. Having a background in Hotel Maintenance I wanted to make a tool that could hold a lot of paint for homeowners and commercial properties so that it could be used to paint all of the trim in a house or a door or cut in an entire house etc. Depending on the quality of paint 13 o.z. can cover up to 50 sq. ft. which is quite a bit for a "touch up" tool. If My Paint Saint is going to be used strictly for touch ups the directions on the back state to fill below the max fill line. How does one go about stirring the paint (without reintroducing the some of mess, hassle and cleanup problems the design is trying to avoid)? @George You can stir the paint with the brush. Please see my answer to @michelle above for more detailed info. on this. Thanks so much for your interest! @Shrenik Thank you so much!! My only question is what about paint that needs to be shaken up a bit prior to using? Won't that get pretty messy? Actually, now I see where you have answered this previously. Very good! @Shawmarie Thanks you so much for the positive feedback!! Do you think it is easier to touch-up when using flat paint? Won't the brush marks show up if you are using eggshell finish on a wall? @Julie Professional Painters seem to all agree that flat paint is the easiest finish to touch up with out noticing brush marks. It is not as durable but if you have a paint saint touching up is a breeze. Hurrah! Hurrah! I have been trying to do something like this for years. I'm handicapped and on good days use a walker and bad days use a wheelchair. With either, I seem to ding walls, doorways or baseboards and I despise those dings! I'll go get paint, do touch ups and then 3-5 months later when I want to touch up again, the paint is dried up and/or separated. I'm placing an order today for every paint and trim color in our house. @Linda YAY! Thank you so much for the positive feedback! Looks like a great idea. I showed it to my husband and he asked what the return policy is just in case he doesn't like it? Hi Louise, thanks for the comment! We have a 30-day return policy and you can find all details here. Mark--I just found this and have to note that it's an ingenious idea. I do have a couple of questions. First, do you have any plans to market this product through retailers (HD, Lowes, specialty paint stores)? Next, how will the paint stored in MPS avoid skinning over from long-term contact with the air in the container? It seems to me that it would be advisable to displace the air with some inert gas prior to storing the paint for long periods. Thanks for inventing this! @Louis I am love with Citizen Commerce and at this point in our companies growth The Grommet is a perfect place for us. When I designed My Paint Saint I was not focused on how well it would stack, fit on shelves, or how cheap I could make each individual component. Rather, I wanted to make a terrific tool with high quality materials and parts for a specific application. I have gotten interest from several marketing reps that have products in all of the retail stores you mentioned. However, no major decisions have been made yet. My Paint Saint has been in development for 13 years. We use a 60 shore A silicone gasket to hermetically seal the brush inside the container. The atmosphere inside the container is moist. This type of high quality seal cannot be replicated by re-hammering a metal lid on a can. Oxygen drastically speeds up the rate at which the individual components in paint separate. Our high-quality seal slows this down tremendously. The air in the container becomes saturated with moisture due to the terrific seal and skinning over does not occur within a year and a half for sure. It may occur multiple years down the road but hey, we figured at 15.99, our year and half long test was long enough to start selling. I totally agree with you that anytime you can displace air with an inert gas you are creating an improved environment for paint to rest. If you have that capability this would only improve long term storage scenarios. Thanks again for your comments and interest! This looks like a great idea, but what do you do about the need to stir the paint before using? Doesn't the paint separate in the brush just as it does in the can? @Susan Please see comments above to @michelle and others about stirring and separation etc. This is a fantastic idea! This is going on my gift list for several new home owner friends! @Mary thank you Mary! The first place we sold My Paint Saint was a Home and Garden show. 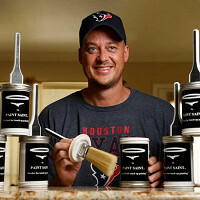 There were 3 different couples that were new homeowners that purchased 3-4 Paint Saints each. It is perfect for new homes! Typically we all just wait until our house gets so bad that we repaint the whole thing and it costs thousands of dollars. The reason we all wait is because painting is such a pain in the rear. This is not the case with my paint Saint. it is as easy as can be. I think they will love the gift, thank you so much ! When left on the shelf for a period of time, most paint separate. How does this affect the paint brush, and how do you re-mix the paint before using? @Cliff ..Sorry…I found the answer above. How do you remix paint that has been sitting in the can for awhile. @Christopher You can use the brush. Please look above for more details on this question. Thank you so much for your interest in My Paint Saint and thank you so much for shopping on The Grommet! What a great idea! We are having our house painted as I write. I was thinking of putting some paint in a nail polish bottle for little touch-up's. Obviously, I am desperate to have something easy to use. Then, surprise, you have the perfect solution. I am such a slob with paint and wondered if I got paint (somehow) on the lid top part that screws the lid onto the jar...will it still seal ok and then later open ok? Or will it be like when I get paint on the lip/trough of the metal cans and is then almost impossible to get the lid open with the paint sealing it? I hope this makes sense to you. How important is it to have to wipe off the screw area part before sealing it down? Hi Susan, thanks for the question! Boy, did we have some pretty good timing for you! In regards to your question, it's probably best to avoid spilling onto the lid, because it getting stuck with paint is a real possibility. Luckily, the two ledges on the inside of the can, the drip catcher under the brush, AND the threads on the bottom for the screwed top, help you avoid that problem altogether! With its ingenious design, My Paint Saint makes touching up paint—and storing it—quick and hassle-free. During his college days, inventor Mark Lacy supervised maintenance for a hotel. Paint touch-ups were full of problems and inefficiencies. He designed My Paint Saint to eliminate every single one. The airtight can has a high-quality brush built into the lid and a generous white space to jot down the color that’s inside. To open, twist off the ring (no screwdriver needed) and get right to work. The ring screws to the bottom of the can so you won’t lose it. Wipe off any excess paint on the two plastic ledges inside. Didn’t wipe off enough? There’s a drip catcher on the rim around the brush.